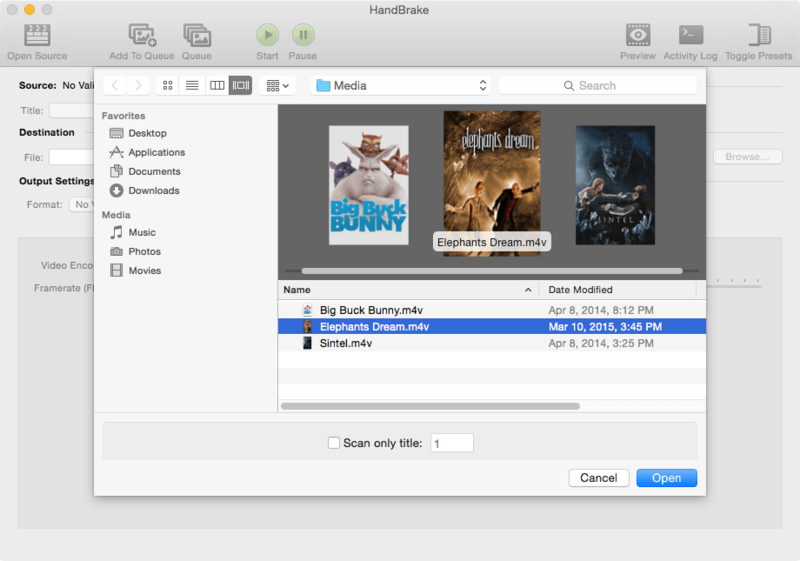 Once you’ve downloaded and installed HandBrake, it’s time to open a video for encoding. You can learn more about Source formats in the technical documentation. Note: HandBrake does not defeat or circumvent copy protection of any kind. It does not work with video files employing DRM. 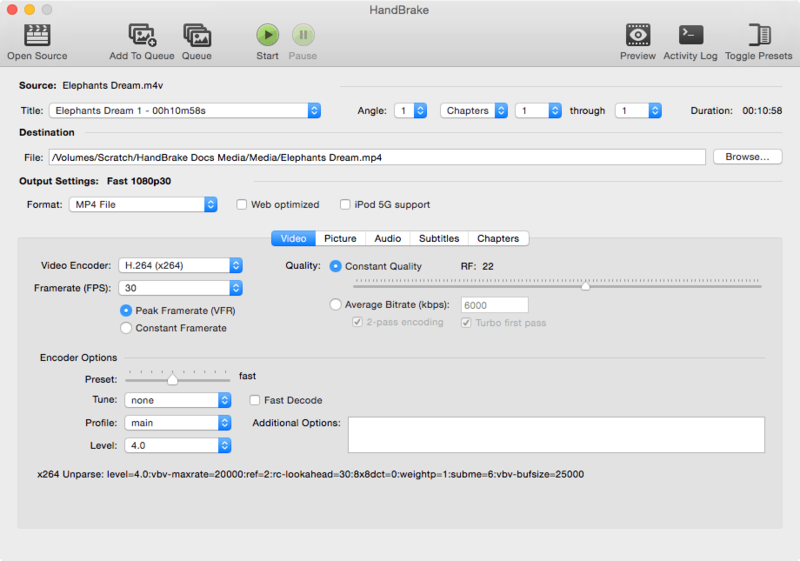 See About HandBrake for more information about what HandBrake does and does not. 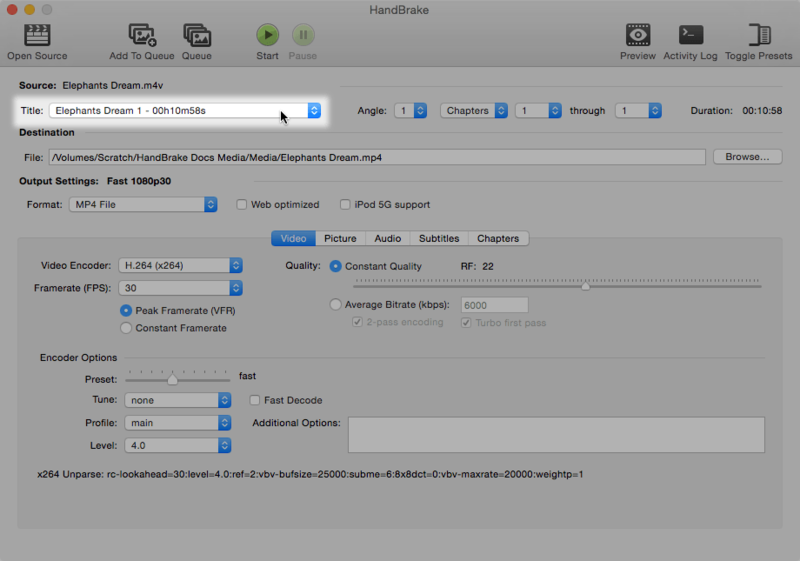 By default, HandBrake presents the Open Source dialog on launch. It is also accessible from the Toolbar at the top of HandBrake’s main window. The Open Source button opens the Open Source dialog. Select the Open Source button to select the video you want to open. You can also drag and drop a video Source onto HandBrake’s main window. The Open Source dialog allows you to browse your files for a video to open. In addition to the Open Source dialog, you may also open a video by dragging it to HandBrake’s main window. HandBrake will scan your selection and after a few moments, the main window will show the file name of the Source you opened along with some additional information. HandBrake’s main window after sucessfully opening a source. Some Sources may contain more than one video clip, or a collection of Titles. Blu-ray and DVD Sources often have multiple Titles. Use HandBrake’s Title control to select which video clip you want to use. Some sources may contain more than one video clip. The title control lets you select which video clip you want to use. Great! At this point, HandBrake knows which video you want to use. 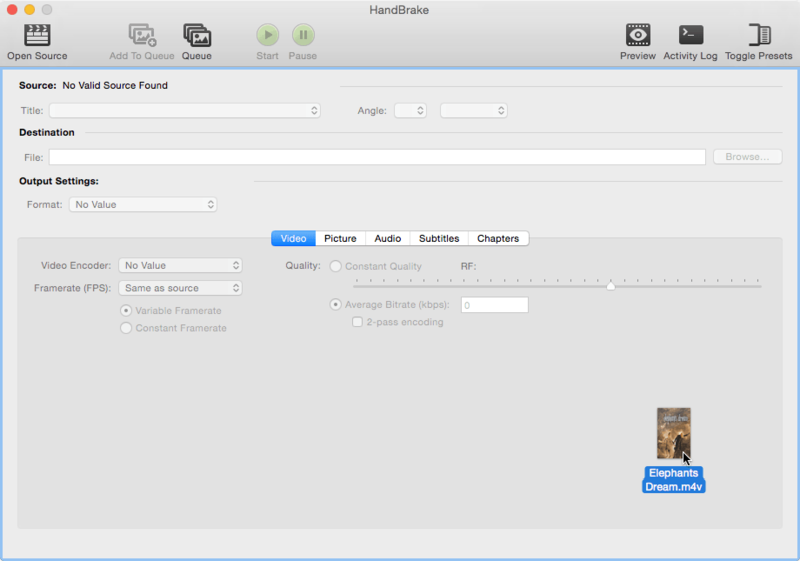 If HandBrake didn’t open your video as as expected or you had some other trouble, you can continue reading to learn more about how HandBrake works or jump right to Troubleshooting common issues. Continue to Selecting a preset.